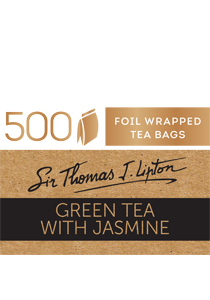 SIR THOMAS LIPTON is a distinctive range of premium tea from the world's most renowned tea regions and is 100% Rainforest Alliance Certified. This fragrant green tea blend is ideal for drinking anytime of the day. Other flavours to complete the range are English Breakfast, Earl Grey, Decaffeinated, Green Tea, Peppermint, Lemon and Chamomile and are also available in packs of 25s. The light, delicate taste of jasmine has been blended with green tea to deliver an ideal drink for sipping throughout the day.